The image illustrates the anatomical connectivity of the ventral tegmental area (VTA). Beier et al. showed that whole-brain input patterns were related to spatial location, but not cell type of VTA neuron populations. Irvine, Calif. - January 24, 2019 – A University of California, Irvine-led study reveals that connectivity within the brain appears to be largely dictated by spatial architecture rather than cell type-specific cues. The study was published this month in Cell Reports. Led by Kevin Beier, an assistant professor in the Department of Physiology & Biophysics at the UCI School of Medicine, the research team mapped inputs to ventral tegmental area dopamine (VTA) neurons and conducted a rigorous analysis of neuronal connectivity to this region. The cells in the VTA are responsible for a variety of both normal behaviors, such as reward and aversion, as well as pathological behaviors, such as drug addiction and depression. 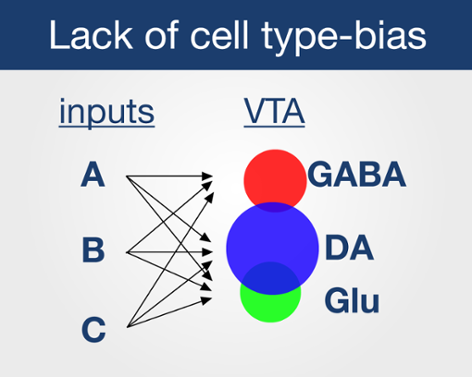 Building on Beier’s previous work published in 2015, the team constructed a comprehensive, high-resolution input-output map of the VTA by standardizing viral reagents and tracing inputs to unique VTA cell types, defined both by the neurotransmitter they released and specific projection targets. "We used a viral-genetic method to identify the factors that influence connectivity onto different cell populations in the VTA," said Beier. "In contrast to most studies suggesting specific connectivity patterns, we found that all of the VTA populations that we examined had highly similar inputs. Furthermore, the neurotransmitter released by the neurons we examined - dopamine, GABA, or glutamate - appeared to have little influence on input patterns." Titled, "“Topological Organization of Ventral Tegmental Area Connectivity Revealed by Viral-Genetic Dissection of Input-Output Relations,” this study was funded by an NIH K99 (DA041445) and NIH F32 (DA038913) from NIDA (KTB), and the Howard Hughes Medical Institute (LL).